We didn’t see this coming! On a lengthy list of celebrities nominated for Villain of the Year at the NME Awards, somehow Vladimir Putin got mixed up with the stars. Any lover of music has heard of the much-loved publication NME (New Music Express). The magazine is brilliant at tracking music trends and at scouting out fresh new talent. It’s safe to say, NME’s opinion is practically synonymous with the truth — for real. But, we must admit that we are forced to go against this music Everest after the NME Awards nominees have been released to the public. You see, for their usually amusing Villain of the Year award (gifted to Harry Styles last year), the publication has crossed the line by about a billion miles. 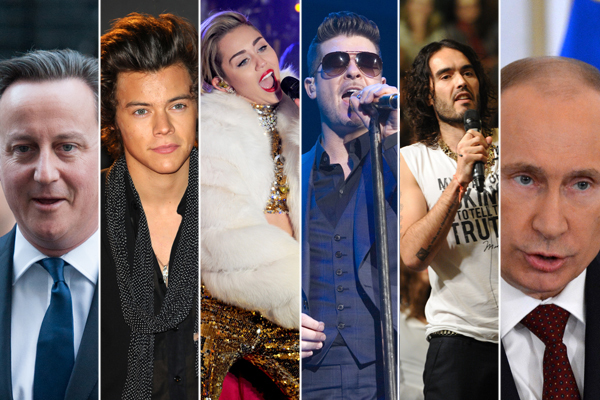 Other than nominating the mop-headed cutie Harry Styles yet again, NME has also put British Prime Minister David Cameron, Miley Cyrus, Robin Thicke, Russell Brand and Russian President Vladimir Putin up for the award. Are we the only ones noticing the absurdity of this? To begin with, intermixing celebrities who have no effect on the grand stage of the world with politicians who do implies that they share a degree of influence. Which they do not. If these nominations are meant to be amusing, why is NME nominating an actual oppressive leader amongst trivial media figures and the relatively tame David Cameron? To equate the twerking symbol of 2013 and her grinding partner, Robin Thicke, to a dictator is not only offensive but also diminishes the gravity of Putin’s political crusade to eradicate the freedoms of the Russian people. There is nothing funny about the stifling of human rights. Ever. 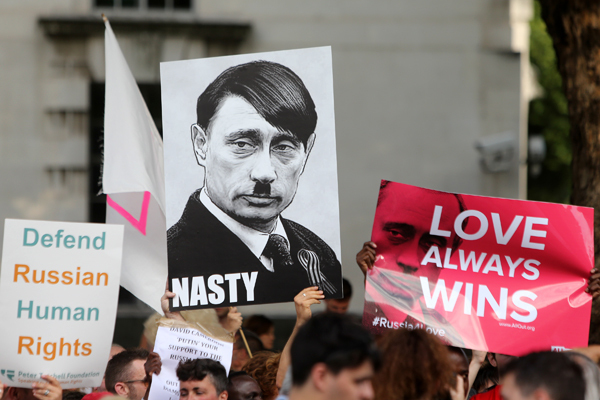 Putin has been accused of rigging polls, ordering the killing and framing of his political rivals and actively oppressing the LGBT community within the country to a point where beating openly gay individuals has absolutely no repercussions under Russian law. It’s disrespectful and mindless to nominate Putin amongst arbitrary celebrities (Cameron not included). NME is disregarding, even dismissing, the very real suffering of those under Putin’s rule which includes so many things that are so much worse than anything Miley Cyrus has ever done. NME is a highly valued and respected publication with a huge youth following. By turning issues of human rights into a frivolous jest, it diminishes the problem to a two-line joke. If the publication wishes to poke fun at celebrities with the Villain of the Year title, they are welcome to do it. But you can’t toss an actual villain into the mix and expect it to stay funny. We say NME owes an apology to those mistreated under Vladimir Putin’s rule, and we hope the publication can remove the Russian President from their list of nominees. What do you think?